Machina slot from Kalamba Games is part of their growing slots catalogue. This particular games uses the Big Time Gaming Megaways licence as do Blueprint on their games such as Primal and Vikings Unleashed. 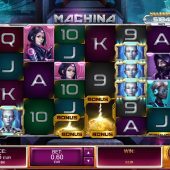 Kalamba have designed and released Machina and you'll see it provided through the Relax Gaming platform, unlike Big Time Gaming's classics like Bonanza and Holy Diver which use Scientific Gaming. The theme here is a futuristic one with robotic sci-fi characters and the reels sit across a desolate urban future world background, with a soundtrack of dramatic synth music as you spin. The appearance of Machina is certainly eye-catching and I get the distinct feeling our bankroll here is being exposed to some extreme danger. I hope I am wrong. Machina slot doesn't have the maximum 117,649 Megaways of say Extra Chilli, but instead has a maximum of 46,656 ways because unlike those games which can have up to 7 rows a reel, here we only have 6. We also have to pay 60 coins a spin, as opposed to a minimum of 20 on the BTG Megaways slot. You may be getting concerned about now, especially when I tell you the 6-of-a-kind pays for our 60 coin stake - Robot 200 coins, the Red, Blue, Green and Purple characters all pay 175 and the six card values pay 120 for the top three and 100 for the lower three. All the symbols can appear stacked with the exception of scattered Silicon Chips on all reels and the Wilds which appear only on reels 2,3,4 and 5. You need those Chips to trigger what can be a very volatile and exciting bonus round - sometimes. So 3 or more scatters are required. You get 10, 12, 15 or 18 free games for 3,4,5 or 6 Chips respectively. The enhancement here is not multipliers or Wilds but a progressive character symbol elimination. You will notice 3 internal jackpots on the left, Silver, Gold and Platinum which begin at 20, 50 and 1000x your 60-coin bet. You get these by landing the top Robot symbol scattered anywhere in view during the free games, and they can be won more than once. 10 or 11 Robots lands the Silver, 12 to 15 the Gold and 16+ the Platinum. The Robots also pay as standard ways too when triggering these jackpots if they are consecutive across 3 or more reels from the left. This is where the character elimination is important as in order to increase the amount of Robots on the reels, you need to transform the 4 characters one at a time. There is a meter on the right of the grid which fills up one space for each Silicon Chip scatter that lands on the reels. For the first two characters, the Red and Blue, you need 4 Chips to transform each of them into the Robot. When you do, each time you get 2 extra spins. The Green and Purple ones need 5 Chips collected to transform them and earn 2 extra spins. The success of this round depends on how far you get with the character transformations. If you transform them all you'll only have card values, Wilds and Robots on the reels aside from the Chips. This virtually ensures a series of lower jackpot and big reel wins if you've enough spins left when you get to this stage! When all the Robots are created you simply get 2 extra spins for getting another 5 scatters collected, but this is rare once all the transformations are complete. This is why the Machina slot is potentially going to become quite controversial. You can buy the 4 different triggers of 10,12,15 or 18 spins via a Bonus Buy. Now let me tell you the cost - 10 spins is 52x stake, 12 are 90x stake, 15 are 185x stake and the full 18 are a staggering 337x stake. Yes, you read it right. 337x bet to buy the top 6-scatter trigger for 18 spins! 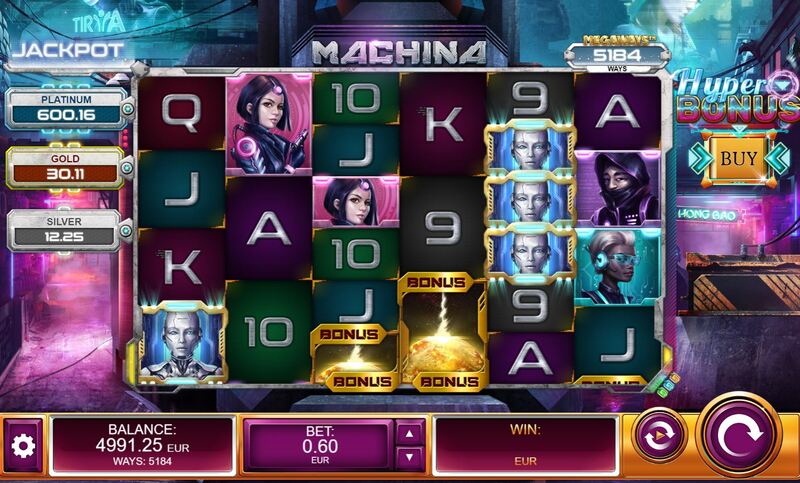 Machina slot is imaginative and looks good with great sounds and animations. You can't fault it for that. Unlike Bonanza for example, you'll be extremely fortunate to hit anything of significance in the base game with those low symbol values though. So it's all about the feature. Due to it's cumulative mechanic the feature is pretty dire unless you start with 15 or 18 spins, so 5 or 6 scatters. This is rare, so you are tempted to use the buy facility which also offers better RTP - the main game is 96.59% rising to 97.42% if only using the maximum buy-in. Three maximum buy-ins will cost you 1011x bet and I'll let you decide if that's responsible gambling or something you'd ever envisage doing. The problem is, the maximum buy-in is the one most likely to give the cost back as those few spins at the very end of the feature are the ones that pay big usually, again due to the mechanic.